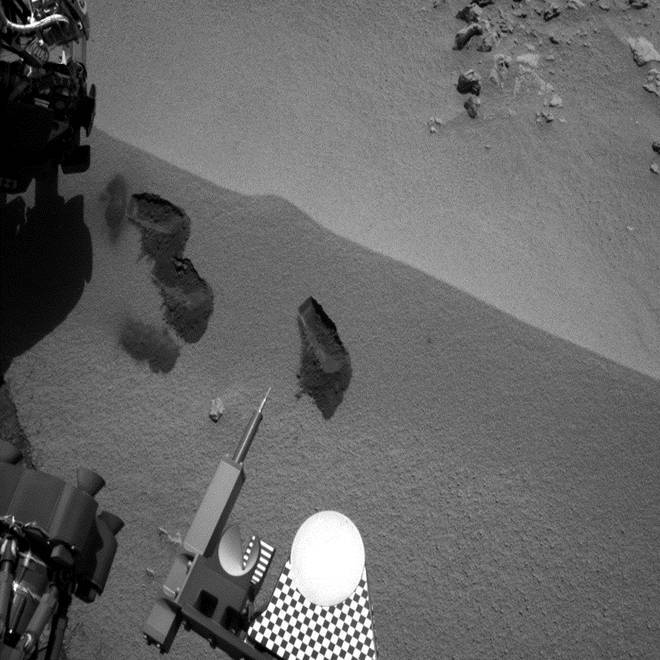 Three bite marks left in the Martian ground by the scoop on the Curiosity rover's robotic arm are visible in this image taken by the rover's right navigation camera during the mission's 69th Martian day, or sol (Oct. 15). NASA's Curiosity rover is analyzing its first Martian soil sample, a load of dirt that may well include some of the "bright shiny objects" noticed by Curiosity's cameras. Scientists have determined that the mysterious bright flecks of material are native to Mars, and may represent a different kind of mineral. That's one big reason why Curiosity's science team members are so anxious to get back the first detailed mineralogical analysis of Martian soil. "The most important thing about our mobile laboratory is that it eats dirt," Caltech's John Grotzinger, project scientist for the $2.5 billion Curiosity mission, told reporters today. "That's what we live on." Last week, Curiosity's cameras spotted a different kind of schmutz that the scientists concluded was plastic debris from the rover itself. This time around, scientists were "super-paranoid" about the potential for putting a contaminated sample into the highly sensitive CheMin lab, Grotzinger said. That's why they took their time deciding whether the latest bright flecks were artificial or natural. By Monday, the scientists decided they were natural — which raised a new question: What's behind the brightness? This image shows part of the small pit or bite created when NASA's Curiosity rover collected its second scoop of Martian soil at a sandy patch called "Rocknest." 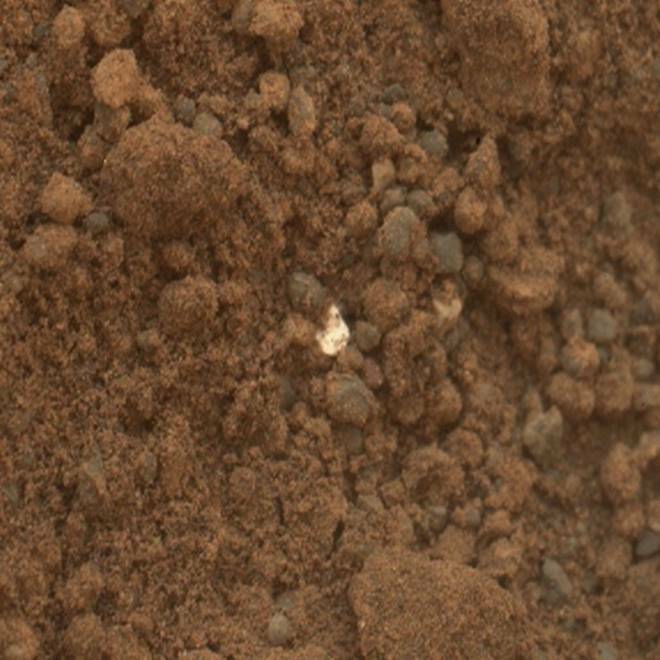 The bright particle near the center of this image, and similar ones elsewhere in the pit, prompted concern because a small, light-toned shred of debris from the spacecraft had been observed previously nearby. However, the mission's science team assessed the bright particles in this scooped pit to be native Martian material rather than spacecraft debris. This image was taken by Curiosity's Mars Hand Lens Imager, or MAHLI camera, during the 69th Martian day, or sol, of the mission (Oct. 15). 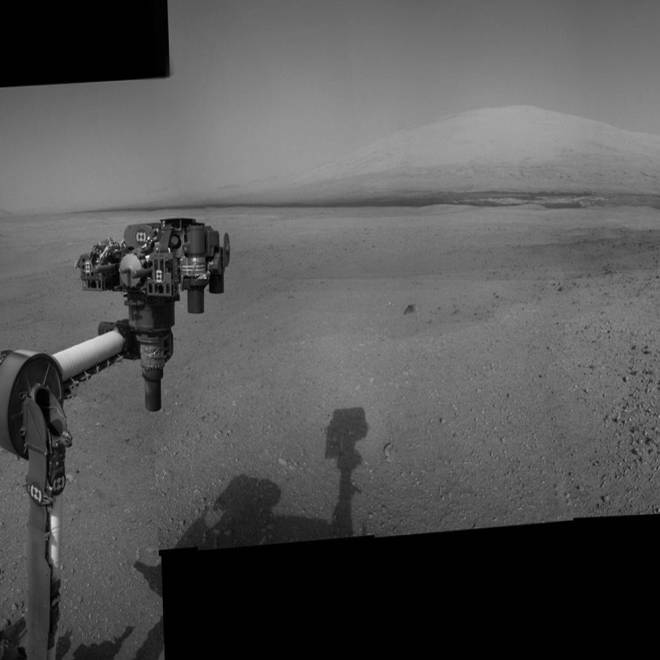 The robotic arm on NASA's Curiosity rover Curiosity delivered a sample of Martian soil to the rover's observation tray for the first time during the mission's 70th Martian day, or sol (Oct. 16). This image taken later that same sol by the rover's left Mast Camera shows the sample on the tray. The tray is 3 inches (7.8 centimeters) in diameter. The sample came from the third scoopful of material collected at Rocknest. Grotzinger said there were two hypotheses on the table. The first was that the mineral grains were cleaved during their formation to create flat, shiny surfaces that reflect sunlight better than typical Martian sand. The second was that the bright grains really are a different kind of mineral, mixed in with the garden-variety dirt. 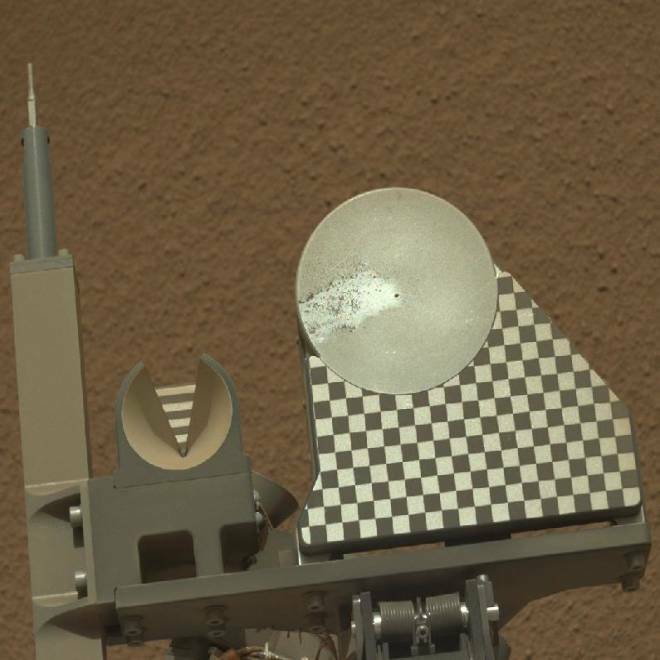 The X-ray analysis from the CheMin lab, coupled with additional readings from Curiosity's laser-blasting ChemCam analyzer, should tell the tale, Grotzinger said. "We're kind of hoping that ChemCam can be useful to analyze these particles on a grain-by-grain basis," he said. One scoopful of dirt, collected by an attachment on the rover's robotic arm, had been used earlier to clean out the internal surfaces of Curiosity's soil-sampling system. A second scoopful was dumped out without being used because of the contamination concerns. The third scoopful was shaken through the system this week, and some of that dirt was fed into CheMin's inlet funnel on Wednesday. The mineralogical analysis is a big part of Curiosity's two-year mission to determine whether ancient Mars had the chemical wherewithal to be potentially habitable. Grotzinger said that Martian soil could well have served as a home for subsurface life billions of years ago, when the planet was warmer and wetter. "Now, once and for all, we hope to address what's in the soil of Mars, mineralogically," he said. Curiosity's other onboard lab — known as Surface Analysis on Mars, or SAM for short — was expected to get its first sample next week. Later on, the rover will use its drill for the first time on Martian rock. Grotzinger suggested that Curiosity would spend the next few weeks investigating the site where it is now: a place known as Glenelg, where three geologically distinct formations come together. "We consider ourselves to be in the promised land," he said. By the end of the year, Curiosity is expected to turn back from Glenelg and make its way toward a 3-mile-high (5-kilometer-high) mountain sitting in the middle of Gale Crater, about 6 miles (10 kilometers) away. The six-wheeled, nuclear-powered rover landed on Mars on Aug. 5. Today is the mission's 72nd Martian day, or sol — and although Curiosity has picked up a few dings on its wheels, project manager Richard Cook said the rover "continues to be in great health." The only recent glitch involved NASA's Mars Reconnaissance Orbiter, which temporarily went into safe mode. That meant the Curiosity team had to turn instead to NASA's Mars Odyssey probe as a backup communication relay for data from the surface. Fortunately, MRO's controllers resolved the safe-mode issue, and "yesterday they went back to full operations," Cook said. Trace the Curiosity rover's journey to Mars, and see the first pictures that the six-wheeled robot has sent back from the Red Planet.